Discover New Face of ZOHO CRM - Produkty Zoho - pracuj online! Zoho has always looked for new ways to improve itself. However, the big revamp of its most core product, Zoho CRM, improves things not only for the users, but also for the Zoho Partners like us. The new functionalities not only allow MMI Group to create new solutions for your business, but also to simplify the implementations of the already existing ones. Using them we can offer our clients new and exciting features that will improve the company’s efficiency. One of the features that benefited the most from this update is the workflow panel. Thanks to a more visual interface, we can now more easily create workflows requested by our clients. 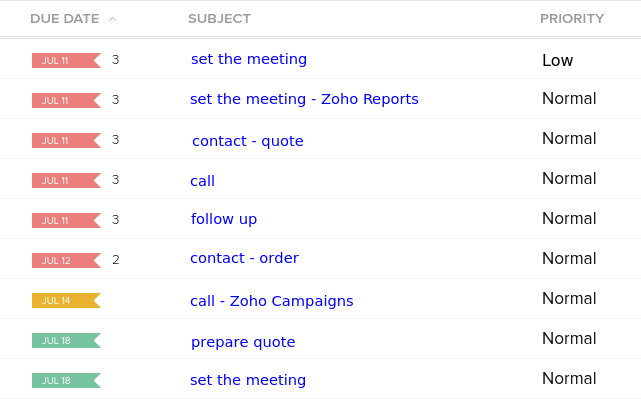 From emails automatically sent after a meeting to a more complex automation that performs several actions at once when preset conditions are met. 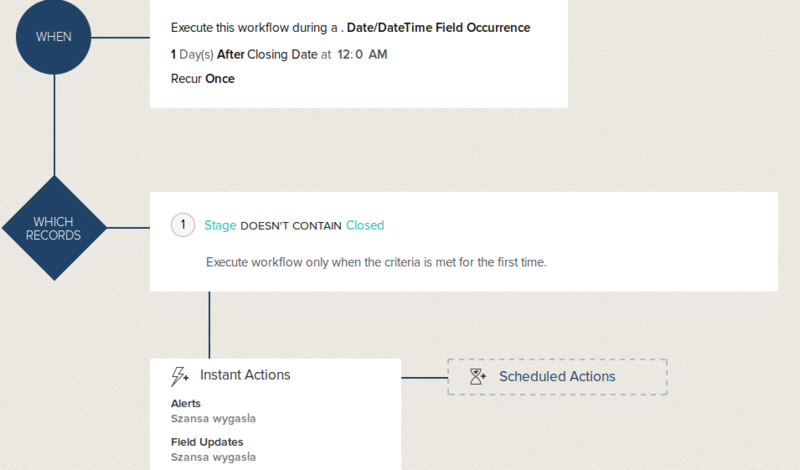 With workflows we can save the time you lose on mundane actions that could be easily automated. For example, you can set a reminder that will be automatically send as a SMS to the client a day before the scheduled meeting. Or maybe you would like to inform your employees each time your company wins a big contract? Have a preset reminder that will inform both you and the client whenever the subscription is about to end? Maybe you have wished to manage the visitors to your website? Wanted to send them emails or create tasks connected to them, but couldn’t due to the limited human resources? Now we can help you achieve all of those with no effort on your side. Workflows will execute all those responses for you and will noticeably lessen your workload. Avoid the internal strife within your company. With the new module options, we can create separate layouts that will allow you to control who has the access to the specific data. We will make each branch of your company view only the necessary information, without creating multiple interfaces for one Lead. 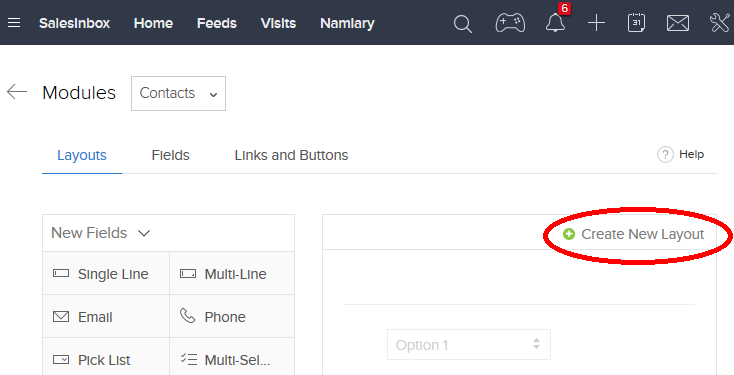 With unique information fields assigned to a specific layout we can create layouts that will be only visible to one branch. So even though, everyone would be looking at the same Lead, the specfied users would see more than the others. This is especially helpfully when branches deal with different products like, for example, a department that sells socks and a department that sells ties. One does not need to know how much the other sells even if they are part of the same organization and interact with the same client. Division of data allows both departments to concentrate on their own agenda without being distracted by the optional information that do not benefit them. Thanks to the new layouts we can help any company or group with a more complex structure achieve the desired data distribution. As much as we should not forget about our clients it’s woefully easy to do just that when things get hectic. Which is why the tasks have now been made much more visible and colourful in the CRM. Not only are the open tasks shown at the top of the Lead’s profile, but they can also be seen on any View list containing the said Lead. Thanks to that it’s much easier to keep track of which clients need to be called right now and with which the contact has been postponed until later. This will simplify the user service for both us and our clients. With the new colourful tasks we can remember about any prior engagements and provide the best service. IT and Sales departments rarely see eye to eye. We feel it is our duty to change this by bridging the gap between the two to create a synergy that will benefit your business. With the new Zoho CRM we can achieve this goal more effectively than ever. Harness the new functionalities with MMI Group and improve your business!